UN climate talks started at COP22 in Morocco yesterday with a goal of putting policies to reduce global warming into action. Last year, 195 countries stood together and agreed to set a goal of limiting the rise in global temperatures from pre-industrial times to 2°C over the course of this century at COP21, and there were even calls to set the limit at 1.5°C. World leaders praised the agreement as a landmark shift in global policy. One year later, it is apparent that meeting this goal may not at all be practical, because 2016 has already been 1.3°C warmer on average than pre-industrial times. Two months ago, August 2016 tied with July 2016 as the hottest month ever recorded in human history. While this may seem highly unusual, a month breaking records in terms of temperature has almost become the norm. The last 16 months consecutively broke monthly heat records through August 2016. In fact, 15 of the 16 warmest years on record have occurred since 2001, and 2016 will likely be hotter than any of them. This unprecedented increase is having well documented effects even now such as contributing to the rise in extreme weather phenomena, increased air pollution, changes in animal migration patterns, and acidification of the world’s oceans. Such effects of global warming are projected to become more pronounced and numerous as temperatures continue to rise. The graph below shows just how dramatic the rise in temperatures has been in recent years. While the global unity we saw in COP21 is unique, it is not the first plan put forth to counter global warming. In reality, a lot of efforts have been made to curb global warming in the past. 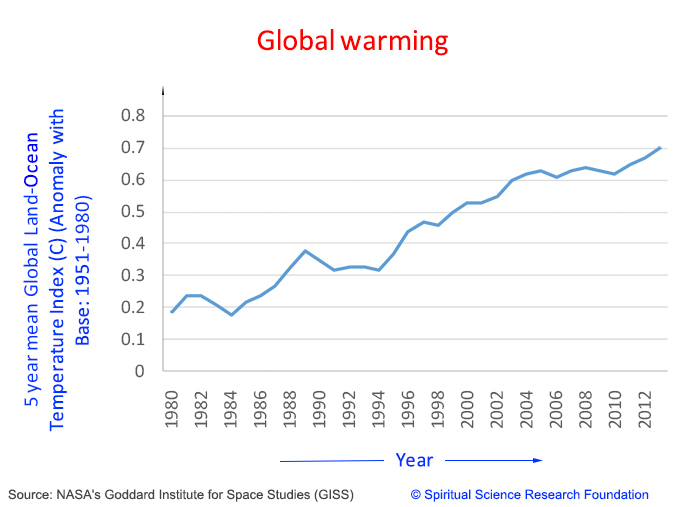 In fact, billions of dollars and countless hours of effort have been putting into stopping global warming for over 2 decades, but temperatures have been climbing more and more rapidly with time. In light of this, it is natural to wonder if our efforts to stop global warming have been complete or if there is some aspect we are not addressing. The Paris agreement drafted at COP21 has gone into effect this November, but will it and the initiatives started during COP22 be successful or will they again fail to arrest global warming like plans before? Are our efforts addressing all the root causes of global warming? You can find a detailed answer to these questions in our article on climate change. 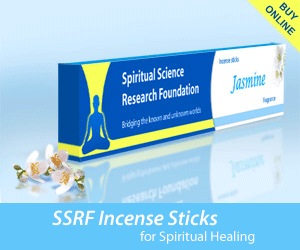 Here we explain how in addition to making efforts at a physical level, it is of utmost importance to make efforts to purify ourselves at the psychological and spiritual levels to address the root causes of global warming.